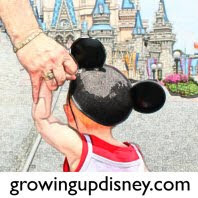 Growing Up Disney: Photo Flashback: Love This! My husband, Andy, and I celebrated our 11th wedding anniversary at Aulani last year. It was an wonderful trip. 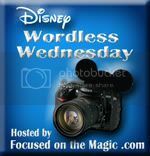 This week's blog hop theme at Focused on the Magic is "Love this! "and I knew I needed to share some photos from Aulani. This was from our lunch at 'AMA'AMA on our first full day on the island. I'll share the rest of the meal later but today I wanted to show you the amazing view from our table, my honey, and one of the best desserts I have ever had. The lagoon over my cup of fruit-infused water. We were in no hurry to give up this view. And as best we could tell, they weren't in a hurry for us to leave. So happy I married this guy! We ordered Mocha Chantilly Cake. And you should too. The Happy Anniversary mousse was a lovely and very delicious surprise. This, my dears, was a dessert that still makes my mouth water 10 months later. The menu says "Coffee Kanten, Coffee Anglaise, Macadamia Nut Nougatine and Chocolate Gelato." None of those words really describes just how incredible this tastes. Check out the other "Love this!" posts through Deb's hop at Focused on the Magic. We are so happy to welcome her back to Disney blogging! Love the pictures! Maybe I can get Mom there one day. amazing! One day... I WILL get to Aulani!! Great photos. Sounds like an amazing trip - makes me miss Aulani, can't wait to get back there. Thanks for sharing! LOVE this!! What a magical anniversary you had! Aulani is on my bucket list. So beautiful! Congratulations on your anniversary! What a fantastic way to celebrate! Wow, I would love to visit Aulani. It looks amazing!